Universal Moulders & Engineers ensures achievement of operational success of belt conveyors, in a way, the shell is made from Mild Steel ERW black steel tube superseding IS:9295 & IS:1239, pressed steel housing from CRCA sheet, shaft of bright steel bar, sealing system consisting of (back-seal, double labyrinth, moulded dust cover, a rain cap), single piece fabricated steel idler frame and rollers fitted with seize resistant ball bearings and supersedes IS: 8598. Length(mm):190, 200, 240, 250, 305, 315, 375, 380, 455, 465, 525, 530. Self - align carrying idlers ore portland cement transportation . Over the years, we have been able to establish ourselves as a prominent figure in this industry by offering Guide Roller. These guide rollers are examined by our quality experts on various provisions of quality in order to deliver flawless range. 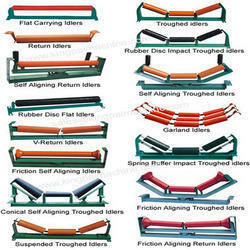 The offered guide rollers are manufactured using finest quality materials in compliance with international quality standards. 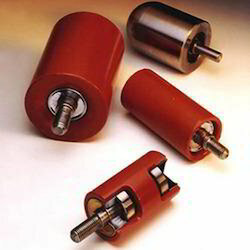 We provide these guide rollers in various specifications for our customers to choose from. 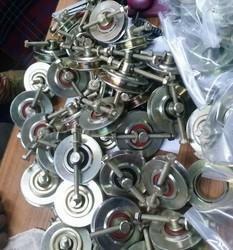 Universal Moulders & Engineers with over 30 years of experience in manufacturing various types of pulleys manufactures High Quality Pulleys at very competitive prices. SBR, Neoprene or D-LAG vulcanized lagging from 1/4" thickness up to 1" thick; 1/2", 5/8", 3/4" or 1" thick ceramic lagging; HE, XT, Taper-Lock or QD compression hubs; Custom shafting in 1045 or 4140 steel; Complete assemblies available with pulley, bushings, shafting and bearings. 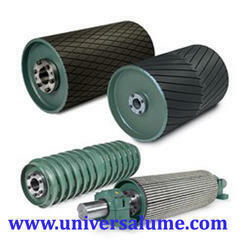 Looking for Conveyor Spare Parts ?